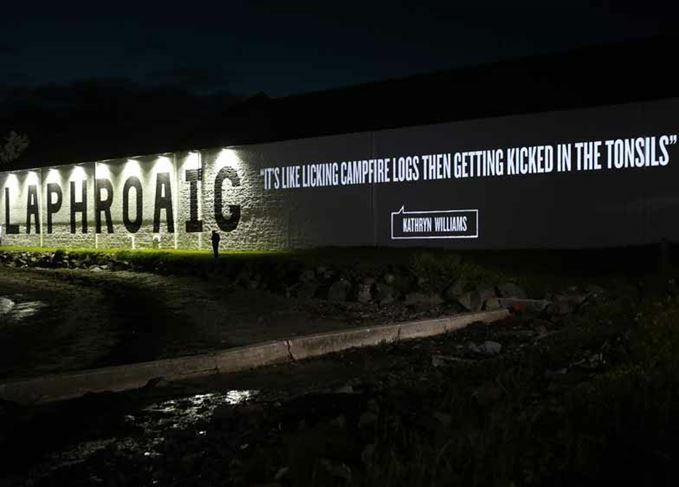 Islay single malt Laphroaig will project ‘Big Opinions’ onto its distillery walls for one week only as an extension of its #OpinionsWelcome campaign. Big Opinions will run from 11-15 October, displaying real-time Twitter views from around the world onto the 200-year-old white walls of Laphroaig’s Warehouse No 1. Laphroaig distillery manager John Campbell will personally select each opinion for display, which will be accompanied by the Twitter handle of the social media user in question. Those whose views make the final cut will receive a photograph and a video of their opinion being broadcast across the distillery’s exterior. Fans can watch the five-day spectacle broadcast live at www.laphroaig.com/opinions. Laphroaig – owned by Beam Suntory – describes its #OpinionsWelcome campaign as an ‘open-armed invitation for all to express their feelings on this divisive whisky. Big Opinions gives the public the chance to voice their opinions around the world. Be candid. Be real. Let creativity run riot’. The peated whisky brand launched the 2016 #OpinionsWelcome global competition at the beginning of August, asking whisky fans to give their honest thoughts on the 10-year-old, Select and PX variants. There are more than 200 prizes for the best opinions, as chosen by Campbell, including the chance to have your tasting notes printed on the lids of Laphroaig’s white tubes, which will be sold around the world. New bottling aims to celebrate distillery’s two centuries of whisky-making knowledge and tradition. Dave Broom reflects on the site so far and why you won’t see any ‘PR fluff’ on here any time soon.